From the vantage point as associate dean for undergraduate medical education and professor of clinical medicine at the University of California, San Diego, Jess Mandel, MD, is able to monitor the pipeline of burgeoning medical professionals in real time. Having dedicated his career to academic medicine, Dr. Mandel has gradually become an in-demand curricular architect, helping to revise UCSD’s entire medical school curriculum after joining that institution in 2006. He’s also serving as the co-investigator of a large National Institutes of Health grant to expand the medical education program at the Universidade Eduardo Mondlane, the oldest and largest university in Mozambique. Previously, he helped shape medical education at the University of Iowa as the assistant dean for student affairs and curriculum and helped in the creation of UpToDate, a clinical decision-support system. 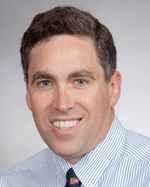 Dr. Mandel earned his medical degree in 1991 from Baylor College of Medicine, and completed his internship, residency, and fellowship in 1998 at the Beth Israel Deaconess Medical Center, where he had also served as chief medical resident. His aptitude for medical education stewardship was recognized early on by his mentors, who include ATS President Patricia W. Finn, MD, says Steven Weinberger, MD, executive vice president and CEO of the American College of Physicians, and Richard M. Schwartzstein, MD, associate chief of pulmonary and critical care medicine at Beth Israel and vice president of education. Pulmonary vascular disease has been Dr. Mandel’s clinical and scholarly interest since fellowship, and he’s helped to establish programs at Beth Israel Deaconess, the University of Iowa, and UCSD, where he spends a half-day every week in the PH clinic and another 6 to 12 weeks a year in the MICU. He’s written several articles as well as the Mosby/Elsevier textbook Pulmonary Vascular Disease. “Certainly, at USCD we have an amazing pulmonary vascular group, both in terms of small vessel disease and chronic thromboembolic disease,” Dr. Mandel notes. Dr. Mandel serves as editor of the Expert Clinician section in the Annals of the American Thoracic Society and as vice chair of the Planning and Evaluation Committee. He previously served in the Education Committee, and in 2010, he won the American Thoracic Society Clinical Problems Assembly National Clinician Educator Award.